I’ve seen this several times and finally had to give it a try. As simple as it is, they were entertained over half an hour! Step 1: Sprinkle baking soda all over a tray. So easy! Yet they loved it! They explored with holding baking soda on their hand while adding the vinegar to feel the fizz and played in the baking soda/vinegar paste, too. 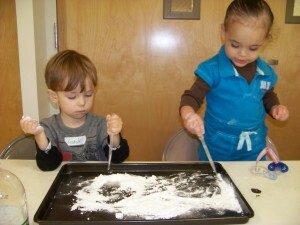 This entry was posted in What We're Doing, What We're Learning and tagged Easy, experiment, science, Toddler. Bookmark the permalink.